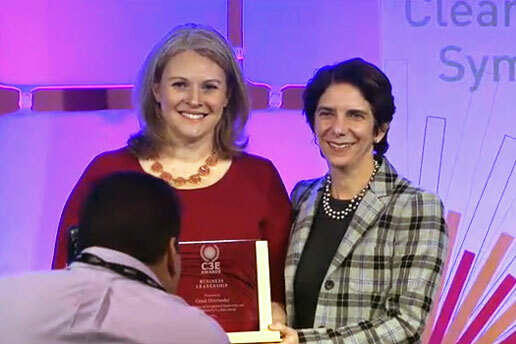 Grace Overlander (left) accepts her award from Lisa Frantzis, senior vice president of strategy and corporate development at Advanced Energy Economy, at the C3E Women in Clean Energy Symposium. Girls and young women who like to make things should have the opportunity to “build and fail fast,” says Grace Overlander SM ’08, MBA ’08, who recently received the Business Leadership Award at the 2015 C3E (Clean Energy, Education and Empowerment) Initiative’s Women in Clean Energy Symposium. The event, held in Boston Nov. 4-5, was co-hosted by the MIT Energy Initiative and the U.S. Department of Energy. Overlander is the manager of new product introduction at Tesla Motors and was instrumental in introducing Tesla Energy, which is expanding markets for home and industrial energy storage. Upon graduating from MIT’s dual-degree Leaders for Global Operations program (LGO), Overlander worked at General Motors as an assembly line supervisor at the Chevy Malibu plant in Lake Orion, Michigan, and later transitioned to the team that launched the Chevy Volt Battery Assembly Plant. “Overlander’s work at GM also established processes to drive product quality earlier in vehicle development, resulting in faster more successful launches,” says her award citation, which also notes that she has been a champion for educating students and coworkers. One of Overlander’s mentorship efforts that has directly benefited LGO is championing plant treks, a highlight of the LGO program, for students and others to introduce them to electric vehicle technology. Overlander told a story of how her five-year-old daughter tried to make binoculars from toilet paper rolls and plastic wrap and was frustrated when they didn’t work as she had hoped. “I explained to her that it’s OK to try something and fail at it, and that this is something I do every day when I go to work and you go to day care,” she said. Overlander has spoken to many university students, including those in LGO’s Global Operations Leadership Seminar, teaching about battery technology and processes to drive faster improvement cycles. She has also served on LGO’s Operating Committee and Admissions Committee and has been active in the Women of LGO alumnae group. Fellow LGO alumna Milo Peavey Werner SM ’07, MBA ’07, who won the C3E Innovation and Technology Development Leadership Award in 2013, nominated Overlander for this year’s C3E Business Award. In her nomination letter, Werner — a former Tesla colleague and now director of new product introduction operations at Fitbit — highlighted Overlander’s mentorship activities for women at GM and Tesla and noted that she acted as the liaison between the Sloan Women in Management (SWIM) and the GM Endowment that supported the SWIM’s yearly conferences.